Each Red Hat® JBoss® BRMS subscription provides a compelling combination of technology, including a business rules management system (BRMS), complex event processing (CEP), system management, and an application platform to run it all on. In comparison, IBM Operational Decision Manager provides BRMS and CEP capabilities. 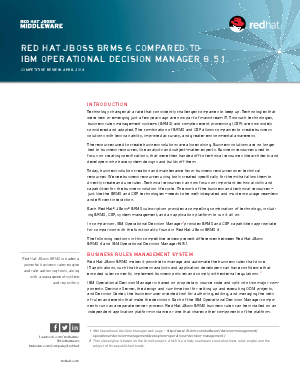 Check out the differences between Red Hat JBoss BRMS 6 and IBM Operational Decision Manager 8.5.1. in this competitive review.